The jelly roll rug is an amazing project that is so simple to make-with a few good tips and tricks! These little needle books will become treasured heirlooms in your sewing basket. 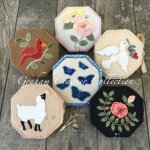 Learn wool applique, simple embroidery stitches to compliment your applique, and how to stitch the books entirely by hand!